Skills and Talents – How Do They Work? Skills and talents are two words that we’ve been throwing around in diaries or our twitter feed for a while now. What exactly are they and why should you care about them? I’m going to answer at least part of that question today and the answer, I hope, throws some interesting light on our development process. Skills have been in Card Hunter since its inception. My initial vision of the game was one where you equipped characters with various items and then those items determined what cards were in their decks. So, you equip the Reliable Axe and you get a whole bunch of Chop cards, for example. We’ve stayed close to that vision. But one oddity of that idea is that a character is a bit of a cipher. If you can re-equip your character with new items, you’ve entirely changed what and who that character is. Would there be no features that distinguished one character from another then, other than what items they were carrying? You can see that this is an “item”, as we call them, that is, it’s a thing that you equip that puts cards in your deck. Unlike other items you’ve seen so far, that we call equipment, this is a skill. The idea is that, unlike regular equipment items, skills would be acquired by individual characters when they levelled up and wouldn’t be transferable to other characters. Each character would have a number of skill slots that they would have to fill with skills from those they had acquired during their growth. This would make each character unique in that they would have only a limited set of skills available. 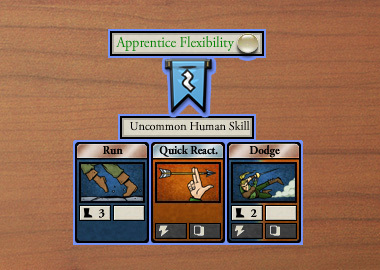 Would these skills be acquired randomly or would you get to pick on level up? Well, we were tossing up between those two options. Randomness can be fun, but choice is nice because it allows you to grow the character in a direction you choose. Want a warrior that focusses on tanking instead of offence? Choose the defensive skills when you level up. Want a dwarf that works well in an all-dwarf party? 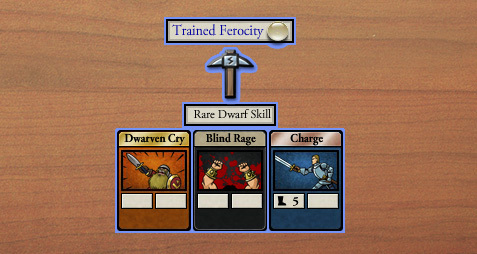 Choose skills that contain Dwarven Warcry. The system can be annoying in multi-player. If you miss out on a skill you later find that you want in order to build a particular party/deck, there is no way of “going back” to the level where you might have acquired it and re-acquiring it, unless we added some sort of character respecing function. As with all these kind of systems, you often have to make a choice about which skill to acquire without having a good understanding of whether you’ll actually want that skill in the future. 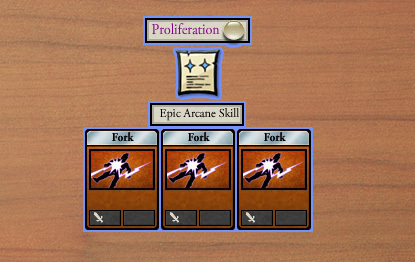 It complicated the deck building interface considerably because we had to separate out the skills (which belong to specific characters) from the general item pool that can be used by every character. If you only get skills when you level up, you would naturally end up with a lot less of them than regular equipment items and no way to acquire more. It’s really another example of the tension that exists between single and multiplayer games. Anyway, after much contemplation, we decided to cut this system and just treat skills like regular items. That is, you find them when adventuring and you can equip and move them around from character to character, just like you can with equipment items. Note: it’s still possible that we might need to introduce “soul bound” type items in the future, i.e. items that can’t be transferred from one character to another. We’ll need to think very carefully about that though because of the interface problems I described above. So, what distinguishes a skill from an equipment item now then? Well, skills come in two flavours: class-based and race-based. So there are arcane skills (wizards), martial skills (warriors), divine skills (priests) as well as Dwarf skills, Elf skills and Human skills. This gives more distinction to the different class/race combinations since each class/race has a unique combination of slots that accept different skill types. There are special cards that only occur in certain skill items, so you still have to plan carefully if you want to build a particular type of deck. But if you have a high level Dwarf Warrior, and you decide that you really would like an extra copy of a low level Dwarf skill, you can always go back and adventure to try to find it (I’ll talk about de-levelling later). Although we gave up something when we made this decision, overall I felt it was a win for the game for two reasons: firstly, it saved us work, allowing us to move forward with our development. Secondly, it simplified the game considerably. Deck building is complex enough without adding more constraints and features. That’s important. OK, then what’s a Talent? I don’t have time to fully explain them this week, but you can see them in the item illustrations above. They’re represented by the little glass beads next to the item names and they determine which items you can use. I’ll run through more exactly what they are and how we came to adopt them next week. That’s interesting. I always assumed a lot of items worked like skills do anyway, in that some items would be available to all, but a good percentage would be restricted based on class or even race. I also thought maybe talents would be something you picked for a character at level 1 and stuck with. But that has the same problem as your initial skill implementation so it’ll be interesting to read the talent dev diary. I believe limiting certain cards for certain races/classes would be sufficient “binding” to some cards. But overall you could add a few skills (basic ones) that players would win by lvling up, because treating skills as items can also be a shot in the dark. Because it would be too random/luck based. I don’t know about its game destroying elements but I do think this is a good system. If they do something similar to what The Old Republic does with modifiable equipment drops in dungeons, that is make it a random chance drop but limit what traits or talents you can get in a dungeon to just two or three specific cards, I can see that worry becoming a non-issue. I fail to see the need for skills in their current form. 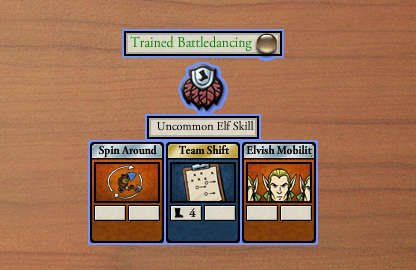 You could have class- or race-specific equipment doing the same things (Mighty Axe is warrior-only, circlet of Elven-kind is Elf-only) and avoid the flavor-killing “Bob gives his Trained Battledancing skill to Merv”. Skills just don’t seem different then items or equipment. Currently, as I understand it, warriors can equip weapons while wizards cannot due to the slots they recieve. Wizards have differenent item slots that warriors can’t equip, so there’s a significant amount of items that can’t be swapped between certain classes. That seems to function the exact same as a warrior skill versus a wizard skill. Your class choice is still determining the critical slots. Maybe in future you would have more overlap in item usage with new classes, but right now it seems very similar. Race bound skills are a bit more interesting. That at least seems to tie back to a choice you made about the character, and allow race/class combinations to be more defined. Skills are a lot like equipment, but they draw from quite a different set of cards. So, I think you’ll find they are interesting in their own right.